Suppon no Karaage ('スッポンの唐揚げ', is classified into deep-fried food), is known as Deep-fried Soft‐shelled Turtle in English, and 唐扬甲鱼 (Tángyáng jiǎyú) in Chinese. 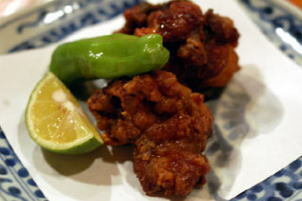 Suppon Turtle Karaage, Fried Soft‐shelled Turtle. Soft‐shelled Turtle, Ginger, Garlic, Soy Sauce, Wheat Flour.